Finn Harps' Colm Deasy was shown a straight red card after his horrific challenge on Ciaran Coll. The action packed five goal encounter at Ballybofey sparked into life on 37 minutes, as Harps were rightfully reduced to ten men when Deasy was shown a straight red card, for a terrible challenge on ex-Harps man Coll. Derry City's Ciaran Coll was stretchered off at Finn Harps last night. 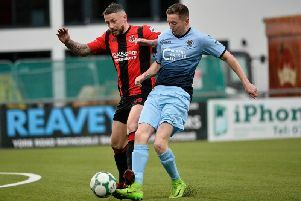 To their credit the ten men drew level on 75 minutes as Nathan Boyle scored against his old club, however things turned quickly back into City's favour thanks to Northern Ireland U21 striker David Parkhouse. The goalscoring wasn't over as Harps scored from the penalty spot on 95 minutes when substitute Mikey Place side footed home from the spot, after Ally Gilchrist was adjudged to have fouled Keith Cowan inside the box.